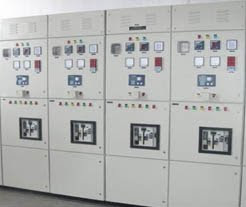 We manufacture Auto, Manual PLC based synchronizing panel that has all control gears and switchgears necessary for synchronizing operation such as Breakers, Protection Relays, Synchronizing Meters and Relays etc. Manual Synchronizing Panel is provided all controls and meters to observe various parameters to help the operator to do manual synchronizing while observing these. Auto synchronizing panel comprises of Special Relay that automatically perform synchronization. Beside that we also provide load sharing relays so that each DG shares equal load and load management relays to control starting shutting off Generators depending upon load requirement. PLC (Programmable Logic Controller) based synchronizing panel provided all control through PLC and with that type of Panel, it is also possible to monitor and control all synchronizing operations through remote PC. Systems in which part of the load is very critical may be best served by paralleling one or more generator sets. Under parallel operation all the generator sets are started at once. The first set to reach the proper parameters will assume the most critical portion of the load, with the remaining sets picking up lower priority loads. In addition, by using a load shedding application the failure of one generator set will not interrupt power to the critical loads, as less important loads can be dropped off the line. Paralleling power sources allows for a wide variety of choices in the generation, distribution and utilization of the system's power. Frequency and Voltage Protection . Generator Control to Match Your Unit. Intuitive interface makes operation simple. Little or no learning curve required to operate system A main screen with navigation buttons and non-system critical buttons/switches. System testing screen allowing the operator to manually initiate automation system testing operations. Generator interface settings latched into the PLC control system upon entry. 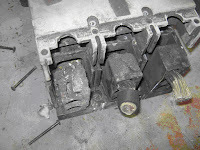 System load add/shed manual control redundant to hard wired manual control switches in master control. Generator optimization settings latched into PLC control system upon entry. The system is designed to dynamically add or shed load based on the system load level rather than using inflexible load blocks. The system is programmed to dynamically track the size of each load individually. This allows the system to quickly determine exactly how many loads are to be added or shed from the system, whether it is in the middle of the afternoon or in the middle of the night. A governor controller is supplied which has the functionality required by different applications and the flexibility to communicate with all types of existing engines. (Can be used in conjunction with speed controller or can do it itself.). Capable of soft loading and unloading the generator. Var/pf controller built in, load sharing (kW and kVar). Equipped with its own automatic synchronizer that checks for voltage matching.